Over the years we've all heard city people tell tales about a "chicken with its head cut off." As the story goes, they were visiting Grandpa's farm and watched with ghoulish glee as the old guy placed the chicken on the chopping block and whacked its head off. The headless chicken then runs around for at least an hour before succumbing to its wound. Grandma, Grandpa, and ghoulish grandchild then eat said chicken for Sunday dinner. Variations on this story include putting the chicken in a box with a chicken-head-sized hole in it. When the hapless chicken sticks its head through the hole to complain, Whack, and it is eaten for Sunday dinner. Another version involves the chicken being stuffed into a gunny sack. Either way, Mr. Chicken is eaten. Since moving to the country a few years ago, I have yearned to treat my family to the "chicken with its head cut off" Sunday dinner experience. What I have learned in pursuing this dream is that the storytellers have left out two irrefutable laws governing Sunday fried chicken. 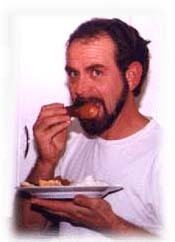 Irrefutable Law I: It is not possible to chop the chicken's head off and eat the chicken without catching it first. Four methods of chicken catching, approved by old timers but obviously untested, kept me busy for most of the summer. I kept thinking that one of the methods would work eventually. Chicken Catching Method I: Walk up to the chicken, pick it up, chop its head off. Yeah, right. Chicken Catching Method II: Coax the chicken into your waiting arms with a handful of grain. Nope. Chicken Catching Method III: I really expected this method to be effective. 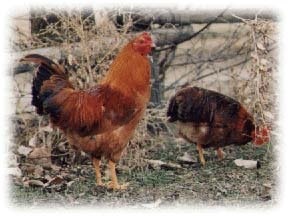 Sneak into the barn, cover yourself with straw, and make authentic chicken noises until a chicken is tricked into walking up to you. 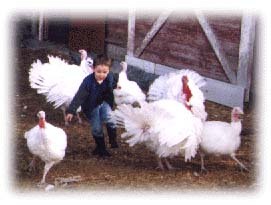 It is then a simple exercise to grab it, chop its head off, watch it run around for a little while, before eating it for Sunday dinner. Fat chance. Chicken Catching Method IV: Invented by a completely crazed and frustrated chicken catcher, this method involves a flying, screaming dive toward the place where the chicken used to be standing. Materials needed for Method IV: A bottle of iodine and a bunch of Band-Aids. There is one other method, but it involves the Safeway meat department, and it's really kind of dishonest. This brings us to Irrefutable Law II which clearly states: A chicken must have its feathers, feet, and innards removed before handing it to the bleary-eyed wife at 4:15 Sunday morning. She obviously did not share my dream. Since my revolutionary chicken catching discovery, we've had Sunday fried chicken quite often. It can be fried a variety of ways, but my favorite of course, is the way my mom Nancy used to make it. Dad used to say, "Mom cooks two chickens. One for Steve and one for the rest of the family." I remember sitting at the table long after everyone else had retired to the living room. I had to make sure that not one little crispy piece of chicken skin got away. My sisters and I used to divide up the "crunchies," those little bits of fried coating. Now, you could go out to the farm and treat yourself and the family the whole chicken catching/head chopping experience, and if you're ever in Hermiston I encourage you to come on out and give it a try. But, if that's not possible, you can always visit the Safeway meat department. They have chickens there that have already been caught, chopped, plucked, and cleaned. Put the oil or the shortening in a frying pan. It should be about a 1/2 an inch deep. Cut the chicken up in the traditional way. Remove excess fat, but leave the skin on. Wash and pat it dry. Dip the pieces in the milk or buttermilk, and roll it in the coating mixture. You may have to do a little sprinkling also just to make sure you get the whole chicken coated in the scrumptious coating. Fry the pieces in the hot oil (375-385 degrees) until browned. 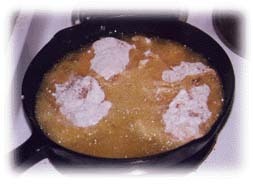 Be careful; the grease tends to pop and jump out of the pan during this part of the operation. Cover and cook 15 min. Turn the heat up a little, uncover and cook 5 more minutes, turning each piece to crisp both sides -- the crispier the better! Place the pieces on paper towels or newspaper to soak up the excess grease. Serve this with mashed potatoes and gravy and peas or corn. 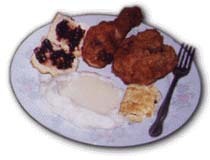 Add some homemade biscuits and blackberry jam, the family and you have our version of Sunday fried chicken.